Incunabula Project blog » Unknown stamp from Augsburg: Query solved. One of the library broadsides incunabula bears a stamp from an unidentified library in Augsburg. Thanks to the comments by Dr Klaus Graf and Verena Godde, my tentative reading of the stamp inscription “<Bibliothe>k des Kathol. Studie<rn****> in Augsburg” has been corrected in “Bibliothek des Katholischen Studienfonds in Augsburg”. The stamp is found in the lower margin of the broadside edition of the Zeichen der falschen Gulden attributed to the workshop of Anton Sorg in Augsburg around 1482 [ISTC iz00019000; Oates (MS. addition) 921.5], now Inc.Broadsides.2. 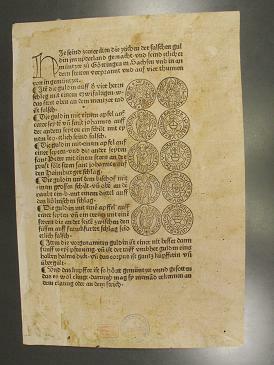 The text is a warning against false coins coming from the Netherlands and it is illustrated with ten woodcut images of the coins to help with their identification. 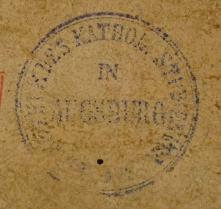 The stamp proves that the sheet remained in Augsburg at least until the 19th century. It was acquired by the library from Erasmus Antiquariaat, Amsterdam (Cat. 213A / 15193) in October 1958. This is the address to the diocesan library of Augsburg. As the catholic libraries in Augsburg do have a complicated history they might be able to help you. But it would be helpful to from when the stamp is. I hope this helps you to identify the stamp. I must have missed this blog entry last October, but let me please add a little note: The false coins in question did not originate from what is today the Netherlands, but from Göttingen in Lower Saxony. The whole affair is quite well-documented, cf my note in VE15 Z-6. The expression “Nyderland” (etc.) in the various Zeichen der falschen Gulden editions refers to the “nidere lande”, i.e. the Northern, Low-German speaking regions of Germany, including Göttingen. Actually, these broadsides are among the earliest printed “newsletters” that were widely distributed in all parts of Germany. These are very important, if little known documents!